Article about bird flu written in November 2005. The Director-General of the World Health Organization (WHO) Lee Jong-Wook said on November 6th 2005 that the H5N1 avian influenza virus was spreading fast. "We have been experiencing the relentless spread of avian flu. Migratory birds, as they move around the world to seasonal breeding and feeding grounds, are infecting domestic poultry flocks around the world." He said it was only a matter of time before an avian flu virus, most likely H5N1, acquired the ability to be transmitted from human to human. David Nabarro Bird Flu chief at the UN / WHO, declared in October 2005 that a human pandemic of bird flu can no longer be prevented, even though the first human to human case has yet to be verified. However the REAL issue is not whether bird flu will jump successfully into humans in an infectious form, but how long it will be before we see a global pandemic of a mutant flu - from whatever origin - birds, pigs or whatever, combined with human flu genes. Since such mutations occur at least once a year, WHO believes it can only be a matter of a decade or two before this happens. This WHO prediction on bird flu in 2005 is based on the fact that the world has lost control of bird flu. Every time a human catches the infection from close contact with such a bird there is a small risk that the virus will mutate - if the person is already infected with ordinary human flu. The US has committed $7bn to help prepare the country for what is being increasingly seen by the government as an inevitable major flu pandemic with high mortality - whether from a bird flu mutation or a totally new new viral type. "The only question is when." US worst-case estimate is anywhere between 200,000 and 1.9 million deaths with 92 million others becoming ill. 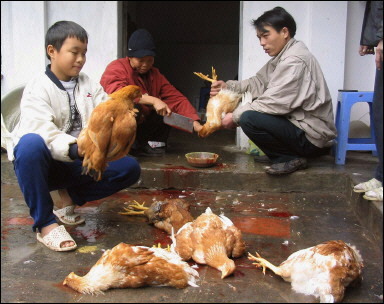 The government annnounced in early December 2005 that they had modelled a theoretical outbreak of human to human bird flu in Thailand, which produced an estimate of up to 722,000 cases just 6 weeks later across America, rising to 92 million cases just 10 weeks after that. Clearly spread at such speed would overwhelm health care systems, and would happen too fast for vaccines to be prepared and given. A moderately severe pandemic on the scale of the 1968 pandemic, adjusted for the growth in US population, would cost the US economy $180bn not including business disruption. The UK government has declared bird flu as public health enemy number 1. It has given a commitment to try and vaccinate the entire population of the country against the new human variant once one emerges, even though spread of such a virus could occur months before vaccinations are manufactured and given. The World Health Organisation has warned repeatedly of significant risks to global health from new mutant viruses - of which HIV, SARS virus and Bird Flu virus are three of many examples we have seen. I have also warned about these risks since 1987, in most presentations to corporations and also in the books Futurewise (1998/2003) and The Truth about AIDS (1987/2004). Just one of these is the form of Bird Flu caused by virus H5N1. In mid April 2005 the Viet Nam Ministry of Health reported to WHO that 41 cases from 18 cities and provinces had been detected in since mid-December 2004. Of these cases, 16 had died and six remained under treatment. By October 17th 2005 there had been 117 human cases of which 60 had died. By mid December 2005 the numbers reported had risen to around 150 of which half had died, with growing concerns about the possibility of many other missed cases. Human bird flu is usually only suspected when someone has a severe, unexplained flu-like illness, in an area where birds are dying rapidly. Mild cases are inevitably going to be missed, unless we start testing groups of other people for antibodies to bird flu. And outbreaks among birds can also be missed or go unreported, as was the case for more than 8 weeks in parts of Ukraine through the Autumn. A human influenza pandemic could cost the world's richest nations $550 billion, according to the World Bank (Report November 6th 2005). Previous studies on flu pandemics have suggested any new outbreak could kill between 100,000 and 200,000 people in the United States alone, which could translate into economic losses for the country of between $100 billion and $200 billion. This estimate includes 700,000 or more hospital admissions, up to 40 million outpatient visits and 50 million additional illnesses. However, as we have seen above, the worst-case US government estimate is of up to 1.9 million deaths.. The World Bank has extrapolated from the US figure based on only 100,000 to 200,000 deaths, to all high-income countries, with a present-value total loss of $550 billion. The loss for the world would be significantly larger, because of the impact in the developing world. The Asian Development Bank warned that the economic damage in the East Asia region from a pandemic could be as high as $282bn (£158bn), assuming 20% of the region's population falls ill.
A two percent loss of global gross domestic product during a pandemic -- like that caused by SARS in East Asia during the second quarter of 2003 -- would represent about $200 billion in losses in one quarter or $800 billion in a year. The US. government has published its own report on the possible impact of bird flu mutations on the US economy. The health costs alone of a moderately bad pandemic, not including disruption to the economy, are estimated to be $181 billion. This figure describes a pandemic similar to that of 1968, which killed about 34,000 Americans, a figure close to the annual average of flu deaths now in a larger U.S. population. Yet the 1918 pandemic killed 500,000 Americans. Economic disruption, through travel limitations and a sharp rise in sick days, would be enormous. The US report predicts that a worst-case avian flu pandemic could kill from 209,000 to 1.9 million Americans. Outside estimates of a global toll have ranged as high as 50 million or 60 million. Our world is very open to disruption by lethal mutant viruses because we still have no antiviral drugs that are as effective as penicillin and other antibiotics against bacteria. The economic impact of an uncontrolled pandemic could be devastating to the global economy as a whole, if death rates are high, and the effects could last more than a year. Some kinds of business such as conferencing and tourism could be severely affected in some parts of the world at an early stage. Impact is likely to be greatest on all activities which cause people to gather together, on travel and tourism, but also on parts of the food and manufacturing industries as well as other business sectors. It all depends on how many cases there are of a human form of the infection, where they are, what the death rate is and how infectious it seems to be, and what the public reaction is. Some countries such as America have already indicated that they may close borders if a dangerous super-flu pandemic seems to be starting. As we saw with SARS, there would only need to be a few thousand cases with a 10% mortality (bird flu at present kills 50% who get it) to cause major business and leisure disruption in different parts of the world. The cost to the regional economy of Sars was been estimated to be many billions of dollars. Despite this, in early November 2005 markets had yet to price Bird Flu risk into their forecasts and risk assessments. The greatest factor is likely to be emotional: worries, uncertainty, fear, loss of confidence, with postponement of expenditure until the situation is more certain. The British government by October 2005 was working on the basis of a million infections in the UK with 50,000 deaths - four times the normal annual death toll from flu - but with a contingency plan in case the death toll was more than ten times as high. So long as business and consumers believe that a pandemic is just a worse version of the usual flu epidemic, it is likely that impact will be relatively small in the short term. However, playing down the risk could contribute to loss of control by making it difficult to justify radical control measures. Government leaders may be faced with difficult choices: give clear, strong warnings and get effective control, at the risk of worrying millions of people and wrecking some industries - or play down the threat and just hope for the best. If death rates are high in the first few thousands infected, it is likely that members of the public will start to change behaviour regardless of what governments say, and leaders may come under huge pressure to implement emergency measures such as closure of schools in some areas, and restriction of all unnecessary travel. Some scenarios could include closure of some airports. Indeed, Reuters has reported that the Chinese government will close all borders if there are proven cases of person to person spread in China. We could see some control measures introduced because of the need to reassure public opinion even where experts believe such measures will have little or zero effect. Air travel is a good example. In 1918 some 300-400 million became infected in a few months without a single aircraft being involved. A country could try to seal all borders and still find it has a major epidemic - perhaps from unrecognised infection that has already arrived, or from unpreventable movements of people. We can expect vigorous debate about what is appropriate to do. With every week that passes, our world becomes slightly better defended, as governments refine their infection control plans, stockpiles grow of antivirals, more aggressive efforts are made to slaughter infected birds, and more bird handlers are vaccinated against ordinary flu (to reduce risk of getting both infections and triggering mutations). If (or when) the human mutation occurs, it will be vital so slow down spread for as long as possible in the early stages, so that the virus can be analysed, treatments tested, and vaccine production started on a massive scale.